This kit includes a fuser, two cassette pickup rollers, and a pickup roller and separation pad for the manual feed tray. Alternate part numbers C3141-67915, RG5-1557, C3141. You can save money by purchasing the fuser on exchange -- see exchange terms in details below. 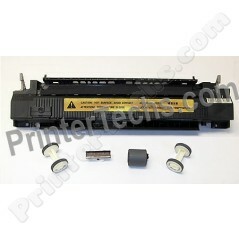 This kit includes a fuser, two cassette pickup rollers, and a pickup roller and separation pad for the manual feed tray. Alternate part numbers C3141-67915, RG5-1557, C3141.